Posted 4/19/2018 10:58am by Cherry Valley Organics. If you want to save some big bucks on your food budget, consider growing your own herbs. 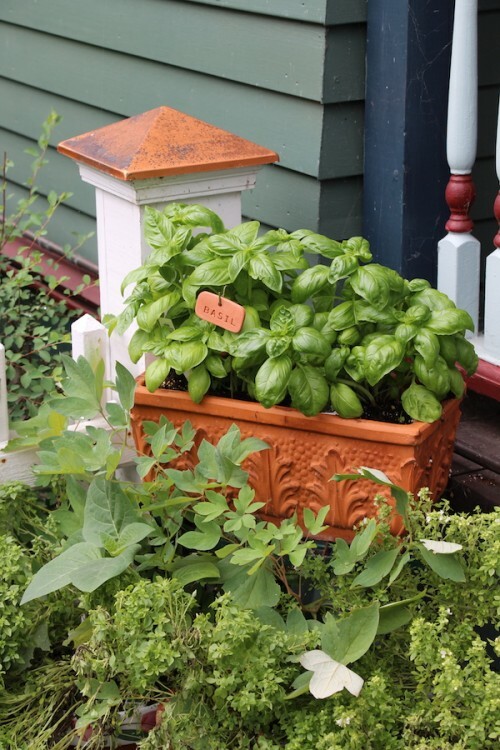 With the average grocery store price of fresh herbs consistently on the rise, it's no wonder many homeowners have started to grow their own backyard and container herb gardens. Most herbs are easy to grow, and those that are perennial, like chives, oregano, and thyme, return to the garden year after year. But, just like the other foods you feed your family, the herbs you grow and cook with should be free from synthetic chemical pesticides and fungicides. So, before you plant that herb garden, let Cherry Valley Organics Farm be your source for certified organic herb plants in Pittsburgh! Below you'll find details on why our plants are an excellent choice and how to purchase them. Why start with organic herb plants? You may wonder why you should buy and plant organic herb plants in your garden, instead of the conventionally grown plants found at your local garden center or big box store. Most herbs that you find in those types of retail outlets are grown in potting soil that includes fertilizers made from synthetic chemicals. Our herb plants, on the other hand, are grown in potting soil that contains only natural, organic sources of plant nutrients. Not only is this better for whoever eats the herbs, it's also better for the plants themselves. 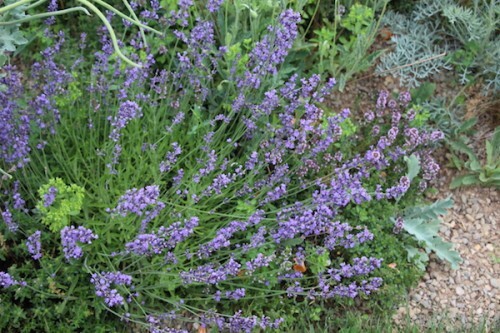 Healthy, vigorous herb plants are better able to fend off fungal pathogens and pest insects. Which brings us to the next reason why starting your garden with organic herb plants is the way to go. Conventionally grown herb transplants may also be treated with synthetic fungicides to control common greenhouse and garden pathogens, like basil downy mildew, botrytis, and powdery mildew. When plants are grown in big greenhouses, they're typically spaced very close together which can lead to an increased rate of fungal diseases that are often managed through the use of fungicides. 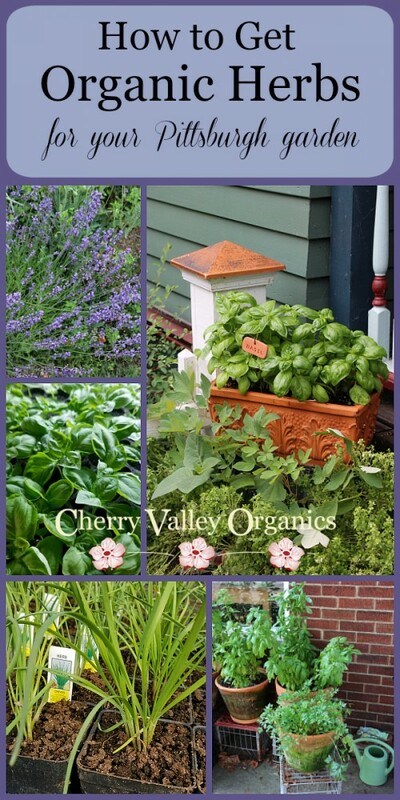 Here at Cherry Valley Organics, we give our starter herb plants plenty of room to grow and our use of organic potting soil means the plants are off to a healthy start right out the gate. You also won't find any synthetic pesticide residues on our organic herb plants. Many garden centers and big box stores can't say the same. Some may even use systemic pesticides. These pesticides are absorbed through the roots and leaves and held inside plant tissues, making it impossible to wash these pesticides of your herbs prior to using them in the kitchen. If you'd like to start a new herb garden in your backyard or in a container, or add more plants to an existing herb garden, there are several ways you can purchase our certified organic herb plants. 1. We'll have herb plants for sale at the Sewickley Farmer's Market every Saturday from 9am until 1pm. The market is in the parking lot of St. James Church on Broad Street in Sewickley. 2. City Grows in the Lawrenceville neighborhood of Pittsburgh sells a selection of our organic herb plants via their retail store. Stop in and pick up what you need. 3. 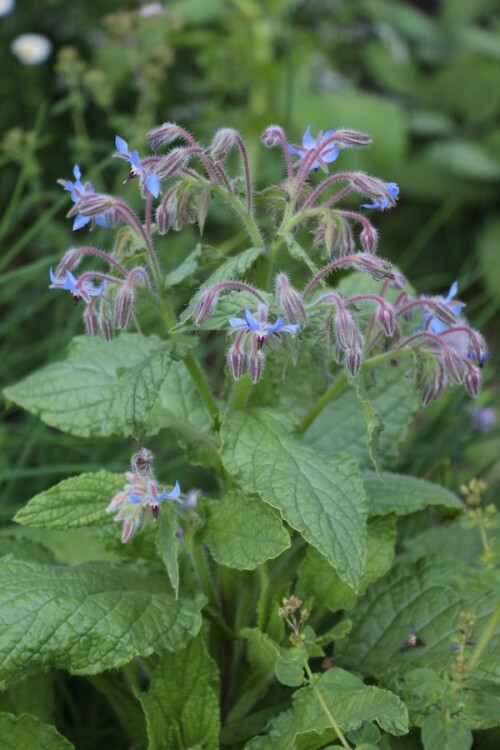 You'll also find our organic vegetable and herb plants at our booth at the Annual Phipps May Market at Phipps Conservatory and Botanical Garden in the Oakland neighborhood of Pittsburgh on Friday, May 11th from 9:30am to 7:00pm and Saturday, May 12th from 9:30am to 5:00pm. This plant and garden sale is free and open to the public and is a great source for all kinds of terrific garden goodies. 4. 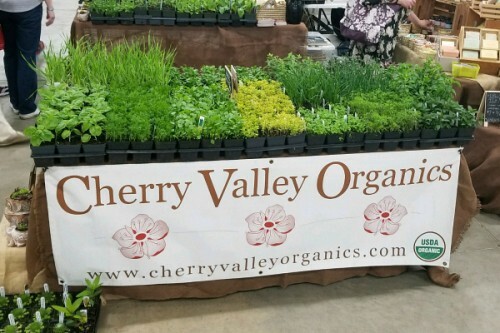 Cherry Valley Organics will also have a sales booth at the Garden Marketplace at the Master Gardener Garden and Landscape Symposium on Saturday, April 28th from 8:00am until 4:00pm at the Shady Side Academy Senior School in the Fox Chapel community of Pittsburgh. The Marketplace is free and open to the public. We'll have plenty of herb and vegetable transplants along with other farm items. 5. Our Farm Share subscribers can also purchase our organic herb plants via their weekly deliveries. We offer our herb transplants as weekly add-ons that you can purchase and have delivered right along with your box of fresh, organic produce. If you're not a member of our Farm Share subscription program yet, here's more info and details on how to sign up. 6. We also have our organic herb plants for sale right here at our farm in Burgettstown, only 20 miles from downtown Pittsburgh. Just shoot us an email to set up a time to stop buy and pick some up. You can always get in touch at info@cherryvalleyorganics.com. We grow the following herbs in 3.5" pots. Our retail price is $4.50 per pot or 3 pots for $12.00 -- a great deal for great plants! Why our organic lip balms are better than the "big brands"